If you’ve been following Myrmecos this week, or bravely trying to, I apologize for the rough ride. An internal server error on September 4th derailed the site for a few days. 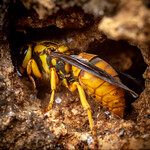 The problem appears to be fixed, but we’ve lost several recent posts, including a superb guest post by myrmecologist Brendon Boudinot. I will have that back up in the next day or so, I hope. 1. Is the new site more or less aesthetically pleasing that the old site? How so? 2. Is tablet/cell phone viewing important enough to you that I should choose a cleaner template? *update: I’ll be shifting through several new blog templates this week. Pros: I like the cleanness overall. Cons: The black leather background would only work if the site was about Porsche sport-cars. The light blue colors to highlight links, buttons and this comment box would work if you change into penguin photography and change the name to spheniscus.net (ok, I hate the blue color; sorry for being so blunt). I’m leaning towards the previous blog format, but that could simply be familiarity. 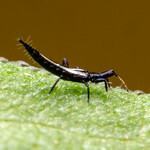 I do read myrmecos.net on my cell phone fairly often, and would benefit from a more phone-friendly format, but ONLY if it doesn’t exact a penalty on the big-screen look. I love the new look, Alex. Colours and all! I’ve always been a fan of clean and simple, and I actually feel the colours and layout help your photos ‘pop’ off the page. – The wordpress default font size is set a tad too large and all caps in right column 8>/. We can always hit ctrl plus to enlarge text if needed (or you can add a fontsize widget) but ctrl minus just makes the total displaypage width decrease without increasing content per unit area. The previous blog incarnation had the default text size about right. – I am not especially a fan of setting display page size less than the entire browser width in any case but I can understand why it’s needed at times. – I believe you can mirror content into a different template layout for tablet/phone viewing with the url terminated with “/m for mobile page” option used by many sites but have no clue of how this works in wordpress coding. – In general, I prefer the quality of the previous look and see no advantage in this current version. I like the previous format better. I generally feel like this format is less professional for some reason. And I definitely agree with Roberto Keller’s comment about the leather background, with the addition that it might also work if this were a site about cows. I really loved the image header you had going in the previous format, especially as you have a photography business to maintain! On a personally biased note, I’m not a big fan of lightish blue, so that also may be influencing my feelings! However, as Bill Tyler noted, humans are generally resistant to change (as are some ants, I might add). As for Question 2: I don’t use a tablet or cell phone for browsing frequently enough for it to make a difference to me. Thanks for the honest opinions, guys. I’ll have another theme for you to look at later this morning. Agree with the poster who didn’t like light blue. Light blue on white, especially in the somewhat condensed font, makes for very hard reading. Nope, I don´t need the leather background, and I find the new “style” a mix of styles – said that, I would not miss your site in any case. OK, this new theme is better than the previous leather theme. Not sure if I like it better than the original — starting to forget what that looked like…. Agree with Joseph JG, but also admit that after a few weeks I probably would forget the old site. I like this 2nd new version much better than the first. Text size is perfect but would prefer black/darker to this grey (=inferior contrast). I assume you will be putting the post-list, comment-list, external-link-list, and recent photo content back on the right column because those were all must-have features of your prior blog and always appreciated. A somewhat darker tint to the page background is always nice for me because the bright light in a darkened room at night causes eye-strain. Something like a sepia, tan, ranging to even black w/white or yellow text is preferable to a bright-white for me, but it’s not critical. This layout has the additional advantage of comment-scroll-bars present only when needed unlike the previous one and the goofy text boxes are gone, YAY ! Thanks for your comments, Bob. The central trouble with the redesign seems to be that I can make the site look good on a cell phone/tablet, or I can make it look good on a desktop machine, but not both. Have you looked into piping mobile-flagged hits into a separate eg /m (=mobile) template. As I mentioned previously, many websites use this mechanism to accommodate both types of displays. I use this when I browse with my android tablet. Adding a simple mobile widget at the top of the page works well enough if you don’t want to code much. Yeah, I think you’re right, Bob (Wait! Did I just say that?). Might be best to just dispense with trying to suit all screens. Anyway, what do you think of this latest template? It’s called “Summit” and seems more National Geographic-y. This one is not bad – a tad more cartoony-comment’s-icons then the one you were using immediately prior to this one mostly because the icons are larger. I could grow to like it The green text (on right, links, post-date:time) is almost too faint to be legible on my display and definitely needs to be darker. The instructions for default HTML tags in comments are a very nice feature. I still think the default article text could be darker and the background less bright but that’s nit-picking. The “fellow-travelers” etc. text-boxes are too tall making the lists go on WAY too long vertically, taking up more page-real estate than desirable, imo. I quite like the aesthetic quality of the bokeh-like green background – especially appropriate for your blog – winner ! Perhaps a nice light-pastel-green background (rather than ivory) with dark-green-links in the main panel will work better – worth a try at any rate ? Getting there, only fine tuning needed now. Make sure to backup, LOL. Theme 2 much better than 1. BioBob is nailing the problems. But if ‘Little Things Matter’ you need to do something more with the header. You can’t ignore the mobile market that is how most people interact these days so having a mobile and desktop version that senses the device would be preferred but also give the mobile user the option to go to the full site.